The holiday season is upon us, and this means many of us are scrambling to assemble our list of gifts. Of course, since shopping for loved ones, friends, and coworkers can quickly add up, we love scanning through all the impending Black Friday (November 23rd) and Cyber Monday (November 26th) deals. Luckily for us, the slew of Black Friday fashion sales offer plenty of choices for us to gift our loved ones (and ourselves). After all, if it costs a fraction of its normal price, we have more room to treat ourselves to some goodies. 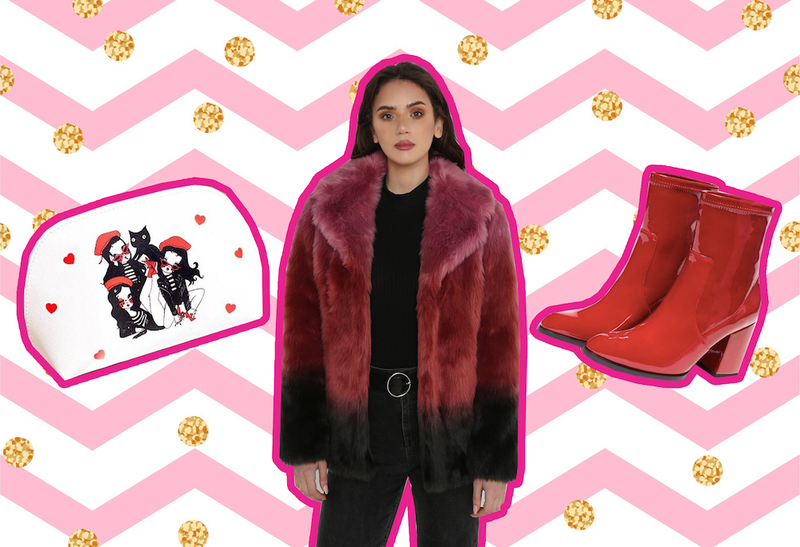 All this to say, we found fabulous Black Friday fashion sales we think you’ll enjoy. From deals on sneakers, luxury accessories, cute dresses, and jewelry, there’s something for you and the people on your holiday list. Below are 21 Black Friday fashion sales that are really too good to pass up. All Black Friday weekend, Valfré is offering 30% off sitewide, so it may be the perfect time to snag the super cute La Clique Cosmetic Bag ($28). The brand is having a 20% off sale, sitewide, on Black Friday. Maybe, just maybe, it’s time to warm up with its Warm Hood Cardigan Knit ($149). Between Black Friday and Cyber Monday, this celebrity-fave brand is offering 25% off orders over $50 with the promo code: Prive18. We’re super into the chic The Alchemist ($29.95) frames. All Black Friday, The Daily Edited is showering us with 20% savings. At checkout, all you have to do is enter the promo code: BLACKFRIDAY20. Honestly, no complaints here. Before the real holiday parties, there’s the pre-party sale Old Navy is offering from November 15th through 20th. They’re offering 40% off storewide. Then, from November 21st through Black Friday, shoppers save 50% off all purchases online and in-stores. Brick-and-mortar shoppers can treat themselves to some $1 cozy socks in-stores on Black Friday day. On Black Friday, luxury loving babes will save 30% off their entire purchase (both in stores and online). This is truly a slippery slope. Starting November 30th and ending December 3rd, animal lovers can save 30% off the brand’s vegan fashion. The sale is sitewide, no promo code needed. This may be the time to finally nab that Flaming Lips Jacket ($349). From Thanksgiving until November 27th, you can find select styles of your dream shades for 30-50% off. That’s a full steal. Black Friday through Cyber Monday will get you a whopping 50% off sample sale items. Also, the promo code, BFCM18, will get you 20-30% off jewelry sitewide. There’s also free shipping on orders over $50, and they have adorbs grab bags starting at $5. On Black Friday, jewelry aficionados can save 30% off Bellabeat goodies sitewide, which gives us just one more reason to gush over the gorgeous Mala Beads Necklace ($59). From Black Friday up until Cyber Monday, fashion lovers can save 30% off super cute bohemian lewks with the promo code: LETSJETSET. Starting at midnight EST on Black Friday, and ending at midnight EST on November 25th (aka the morning of Cyber Monday), ModCloth is offering 30% off $100 purchases, and 40% off $200 purchases (including sale items). Basically, now is the time to get the lovely V-Neck Lace Fit and Flare Dress in Pine ($99). From November 22nd until Cyber Monday, shoppers looking for feminine prints and laid-back silhouettes can save 40% off their total purchase with the promo code: GIVEMEMORE. You can grab a new pair of hoops (or any earring style your heart desires) between November 22nd and 24th with 50% savings. We won’t say no to that. On Black Friday, you can save 50% off select gold and silver like the Petit Magix The Unicorn Necklace or the Mini Magix Charm Necklace. Even better? The brand is offering 35% off jewelry sitewide. Between November 22nd and 27th, Ban.do babes can save 30% off everything on the website (excluding Iconery). So basically, it’s time to finally get those Red Patent Janet Boots ($184). Freya is offering 30% sales sitewide from November 21st until the 26th. Jump on it, this deal is too good to pass up, especially if luxe accessories are your thing. Starting November 19th and lasting up until Cyber Monday, the promo code, TAKE30, gets shoppers 30% off sidewide. So, hey, maybe it’s time to treat yourself to a High Neck Short Sleeve Cashmere Shirt ($185). Keds is giving us a full week of love. From November 20th up until the 27th, shoppers will save 30% off full-priced orders, 20% off sale items and a free gift with each purchase. The promo code, PUMAFRIDAY, will save you 30% off new kicks between November 21st and 25th, proving there is still good in this world. On Black Friday, enjoy 30% off your entire purchase. Now’s the time to pick up something from the coveted Moschino x H&M collab.